A ceramic female figure, with odd, caterpillarlike bumps, cradled in banana leaves. A highly polished wooden ax in the form of a bushbuck's head that is pierced by the metal blade, both loaded onto the shaft of a gun. 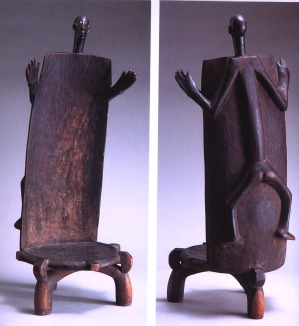 A carved wooden throne, with a back incorporating outstretched arms and a glass-eyed head, designed not to hold a chief, or any human, but rather as a sculpture, possibly to summon rain, or a platform for the presentation of a spirit. 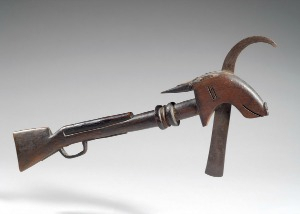 These are a few of the objects on view in "Shangaa: Art of Tanzania" at the Portland Museum of Art in Maine. "Shangaa" loosely means "to amaze, surprise, dumbfound" in Swahili, and the word is doubly apt here. 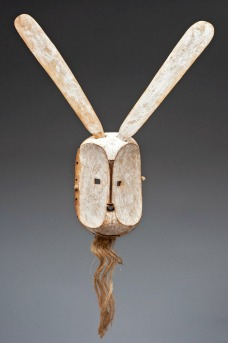 The 165 masks, figures, staffs, pieces of regalia and other objects chosen by curator Gary van Wyk are intended to inspire awe and to illustrate the power imputed to art in Tanzania. And "Shangaa," which includes some distinctly different and even unique pieces, will likely intrigue even visitors familiar with African art: It is the first museum exhibit to showcase the art of present-day Tanzania in the U.S.
History is partly to blame. In the colonial era, Germany controlled East Africa, and Tanzanian art was collected most avidly by museums that eventually fell behind the Iron Curtain, locked out of the sight of the West. And when Tanzania gained independence from Britain in 1961, President Julius Nyerere turned the country sharply toward socialism, aligning with Maoist China and again thwarting Western contact. Scholars, meanwhile, have favored the art of West Africa. So it was only in the 1980s, when Nyerere's successor began to relax his policies, that Tanzanian art begin to attract interest and appear on the U.S. market. Yet history is partly to credit, too. What makes Tanzanian art special, Mr. van Wyk argues, is that the country has been a cultural stewpot since Egyptian and Roman times. At one time or another, Arabs, Asians, Europeans and Americans all moved in or traded with this land whose size—bigger than the Eastern seaboard states combined—and long coastline secured a place in global commerce. Several pieces on view provide evidence: two thick silver wedding anklets, tooled with designs clearly influenced by India; a couple of smoothly carved but unquestionably African wooden corpuses of Christ; a row of ceremonial masks stitched with colorful Venetian and Czech glass beads; a distinctly socialist-realist mask of a combatant. Most convincingly, there's a vitrine full of realistic masks and figures depicting a turbaned Sikh, a nun, a mustachioed Portuguese, an African man creased by age, and an Arab, among others. They were probably made to demonstrate the woodcarvers' expertise to foreign buyers. Historically speaking, this is a bell-curved show: A few objects date to the early 19th century, a few were made post-2000, and the majority come from the late 19th and the 20th centuries, often lacking more specificity. 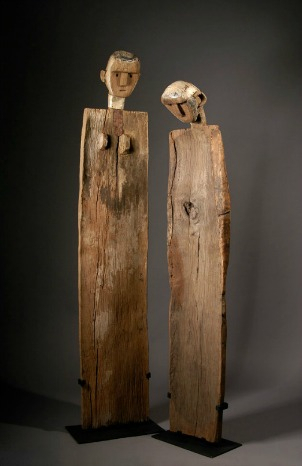 Like most African art, Tanzanian pieces were often made of wood and other ephemeral materials. Preservation wasn't important because it was the spirit embodied by the object, rather than the item itself, that mattered. The first thing visitors will see is a small, schematic mask, less than 7 inches in diameter, with a flat face and rectangular eyes, and that is fitting. Not only is this late-19th-century piece considered to be a masterpiece—it was once featured on a German postage stamp—but it also hints that the many masks here are among the most beguiling objects in the exhibition. Those glass-beaded specimens are standouts: One depicts a rooster, with a blue-and-white striped head, a red coxcomb, beady glass eyes, and chicken feathers suggesting the body. Nearby are two rectangular face masks, decked out with abstract designs reminiscent of face paint. Somehow these manage to be both blank and expressive at the same time. Among the many other notables are a frightful, wide-eyed "Ziba mask," with a howling open mouth, studded with chimpanzee teeth, and a beard of animal hide; a far more tame wooden "devil mask" of a hare, whose aging white pigment gives it an alabasterlike appearance; and a wooden helmet mask of a hyena head whose round, flat ears approach the size of salad plates. Masks, of course, were used ceremonially, and so were wooden dance figures. Those in the swarm on view here, some as tall as 5½ feet and all naked, were used by dance societies as competitive weapons in contests. Some are overtly sexual, complete with genitalia, the better to attract a large crowd and win the day. They all have their own personalities. One noteworthy example appears to be deformed: Her slit eyes, red oval face, pregnant belly, engorged breasts, and twisted leg seem sympathetic, even attractive, but some scholars believe that she may have been deployed in acts of mockery. Using dried gourds as a blank canvas is an ancient tradition, and the array here includes both colorful beaded examples and more subtle, polished pieces, usually with a feminine head made of wood. The gourds stored powders imbued with healing power, or maybe dirt—sometimes about six pounds of it, similar to the weight of a baby, Mr. van Wyk said, and they were held by a girl during her initiation rite. Other times, you might find one sitting on a throne, as the temporary home of a spirit. There is much more to this exhibition, which provides merely a taste of Tanzanian art. If "Shangaa" has a flaw, it's that it unfolds without a real narrative. It takes an ethnographic approach, and groups the items thematically—showing healing art, art related to the slave trade, regalia of precolonial chiefs, and so on. That's fine as an introduction to this art, but it suggests again that much more study of the artistic traditions of East Africa remains to be done.